Diggers Valley: 22 April 2017. The week beginning the 22nd of April 2017. A trip to Whangarei for an appointment with a surgeon Stephan saw in Kaitaia last time. They're still trying to figure out why he has a pain in his middle. One of the downsides of living away out in the beautiful green places is that it can be expensive and time-consuming to access some health services. Some time in the far-distant future, he'll be booked for an MRI for another go at working out where the pain is coming from. We'd just like to know, although the lovely surgeon was reassuring in her assertion that if it were something really sinister, he'd probably already be very ill or dead by now. They now suspect there could be a spine-related nerve issue. On the way north again we visited Kate and Geoff near Helena Bay, had a lovely lunch and part of the afternoon with them and then continued home to do our various jobs before dark. Straight back out again to have dinner with Elizabeth and William, where Ella had spent the day. In the ute, there was no way we were travelling with three people, two of them large, all the way to Whangarei and back. I think Ella enjoyed her day with Aunt Elizabeth. My father had a favourite Aunt Elizabeth; every time I think of Elizabeth by that name, I think of him. This morning I separated the next seven pairs of cows and calves, again up the top of the Windmill lane, where the cows went to the left into 5d and the calves straight ahead into the Windmill. 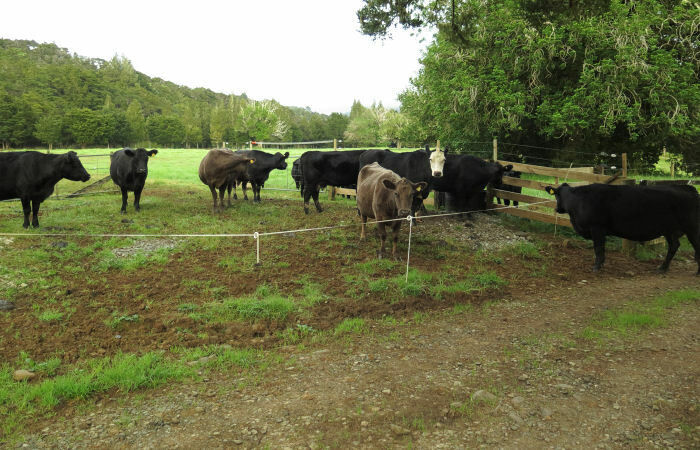 Then I put a tape out around this area so the cows could come out and share the trough with their calves through the rails. 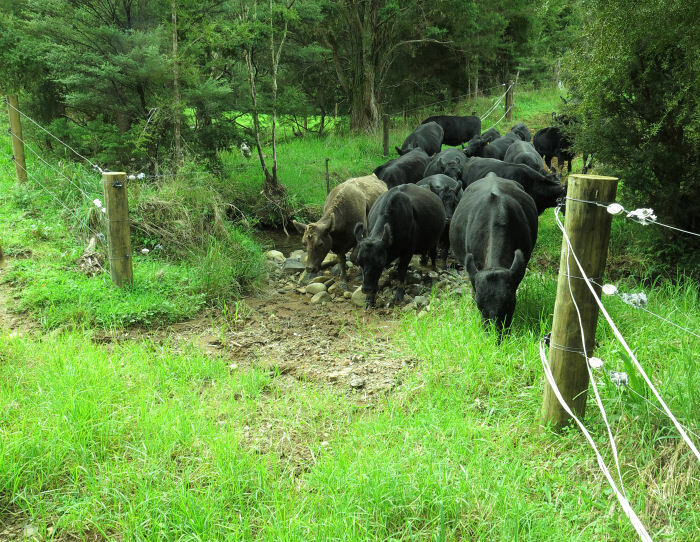 The big water recently brought a load of boulders down the stream and dumped them in this crossing, so the cows had to carefully pick their way across them. Most of them have pretty good feet these days. I stopped to look at the newly-weaned calves because I wanted to see who this one was on the right, looking rather lovely. It is 811, daughter of Jet 777. She's obviously growing really well and looks very good to my eye. I'll be interested to see how she weighs, next time over the scales. She'd been growing quite well (for a heifer on drought feed levels) at 1kg/day and I suspect she's done a growth spurt recently, since the grass has been growing so well. The Coffin-maker's Daughter: a cool name for a novel, I reckon. We looked on-line for instructions on wood bending, finding demonstrations of a technique called kerfing, where cuts are made to the inside of an intended curve, so the wood can be bent without steaming. 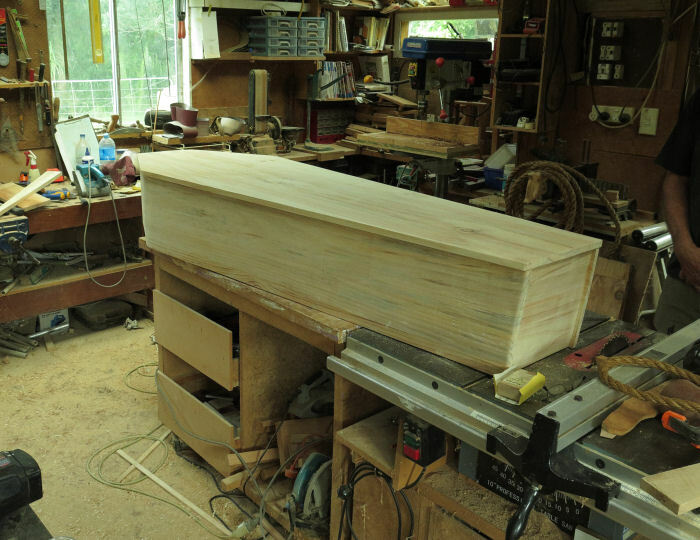 The outside of the wide part of the coffin at the shoulders is therefore a gentle curve, rather than an angle. Here Stephan and Ella were glueing and screwing the sides to the base. The water suddenly stopped this morning, having not been obviously affected by the earlier rains, so I went bush, again, to find out what had happened. I thought there must be some sizeable eels up here but have never actually seen any. It's a steep climb to get here up the waterfall just below our intake! 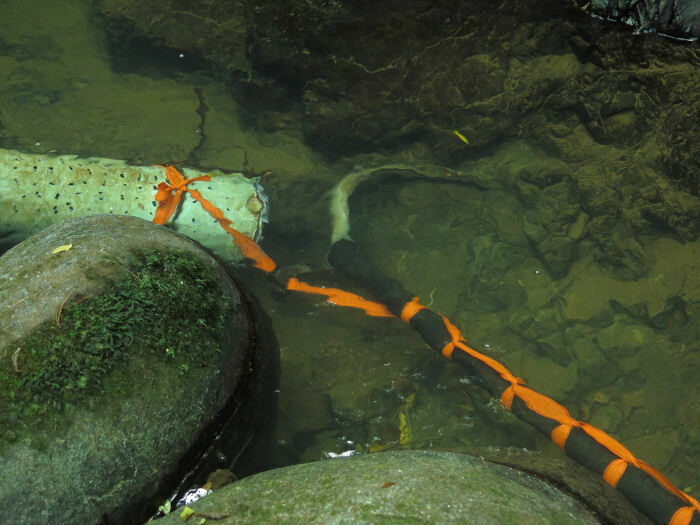 My ratchet straps kept the pipes all in place when the stream last flooded, which is very good to see and we will have been receiving water straight from the stream since then, until this eel happened past and got sucked into the top of the pipe. 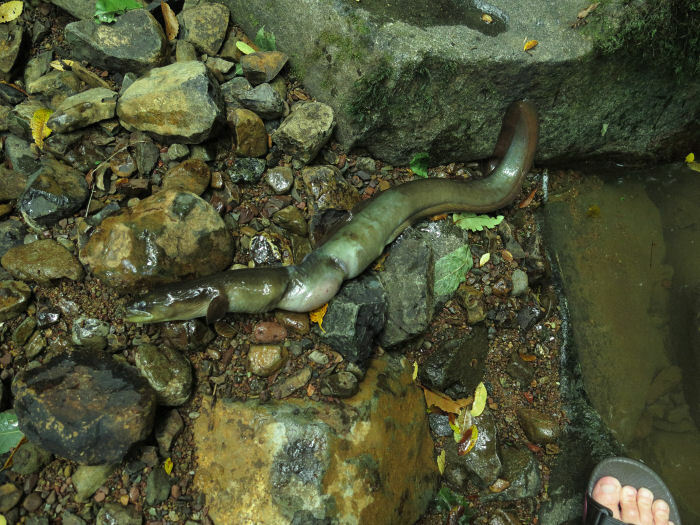 I pulled the eel out, noting that it gasped and writhed a little when I put it down beside the stream. It must have swum past the end of the pipe, been sucked onto the end and gradually fought its way backwards but was then sucked in head-first. Fortunately it didn't go all the way in! There's a reduction in the size of the pipe at the bottom of the hill, which would have caused some real problems. The eel turned around and got back into the stream. I didn't really want it around my legs while I worked, so encouraged it away downstream a bit. I don't know whether its injury is survivable or not but presume it will tuck itself under a rock somewhere and recuperate. I spent several minutes scrubbing eel slime out of the top of the pipe, before reattaching it to the filter and tightening the fitting a lot better than I had before. 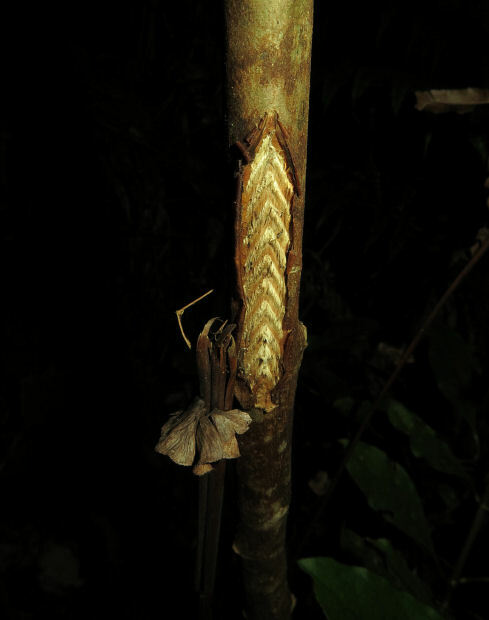 On the way back down the hill I passed this sapling, with the characteristic damage from a cicada's egg-laying activity. Lois came back up yesterday and stayed the night, ready to take Ella home again this morning. I remembered to take the usual photo. 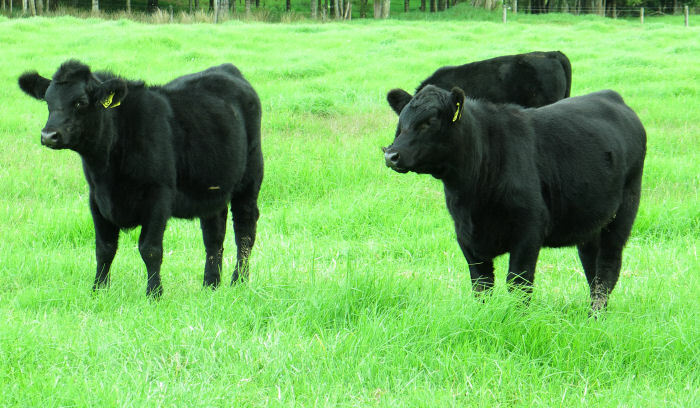 Gradually consolidating the weaning mobs, I combined the 23 now-weaned cows and then sent the latest-weaned calves down to join the others near where the cows now graze. Tonight will be only the third night for this lot, so I still want them next door to their mothers, although they'll now be on either side of a lane. 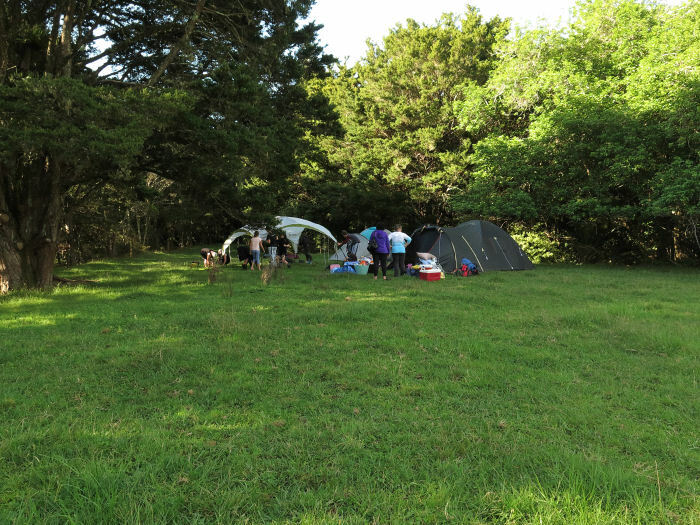 With strict instructions about biosecurity and footwear cleanliness, a group of St John's cadets (10 and 11-year olds) turned up with various leaders and mothers, to spend the night in the Camp paddock. 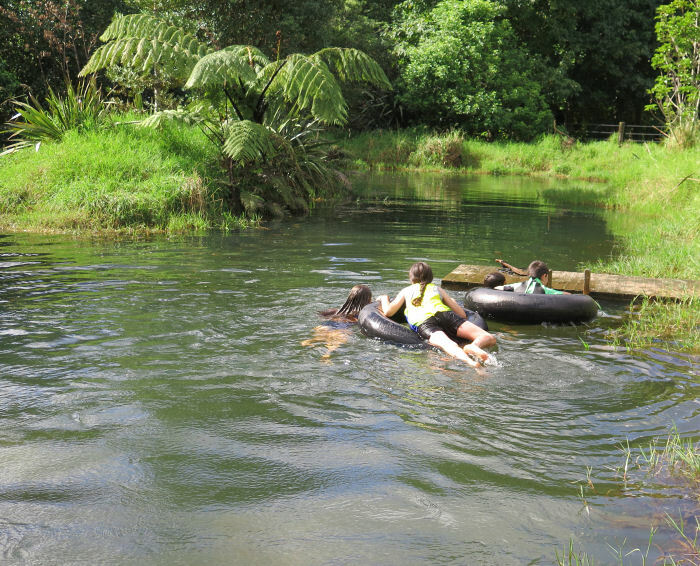 They have streams and bush to explore while they're here, albeit only for 24 hours. Having found the eels in the water system, I wanted to check whether anything interesting had got as far as the big tank, since the water has been a bit cloudy of late. 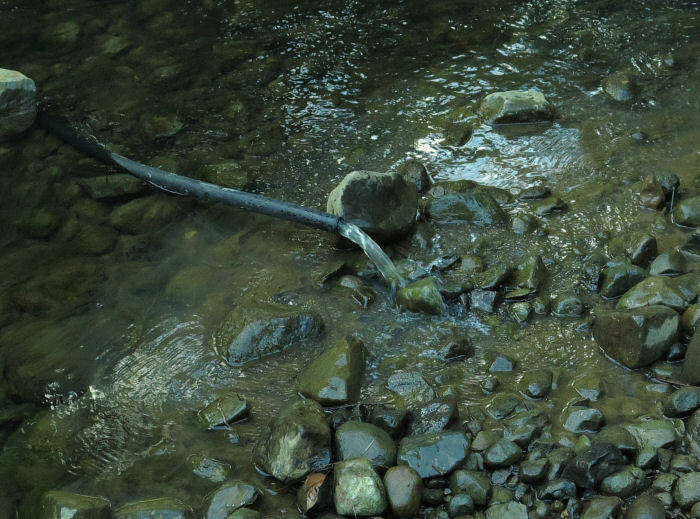 As it wasn't emptying very quickly via the system as it usually operates, Stephan disconnected the outlet and dropped it straight into the stream at the bottom of the hill. As the level dropped, I climbed a ladder to look inside and then threw a handled, water-filled bottle on the end of a rope, in and dragged it across the bottom of the tank to stir up the silt, which made the water pretty cloudy as it came out of the pipe into the clearer stream. We wandered over to see the campers this morning (with Floss on my shoulder, who was a big and distracting hit with the children) and discovered that on a walk through the bush, when one of the adults had feigned a sprained ankle, the children, these fine young first-aiders, had all stood around looking, doing nothing to help. They'd consequently all failed the badge they'd come to do. We suggested they might like to stop at the pond for a swim on their way out, which may have incentivised good camp-striking behaviour in some reluctant youngsters. 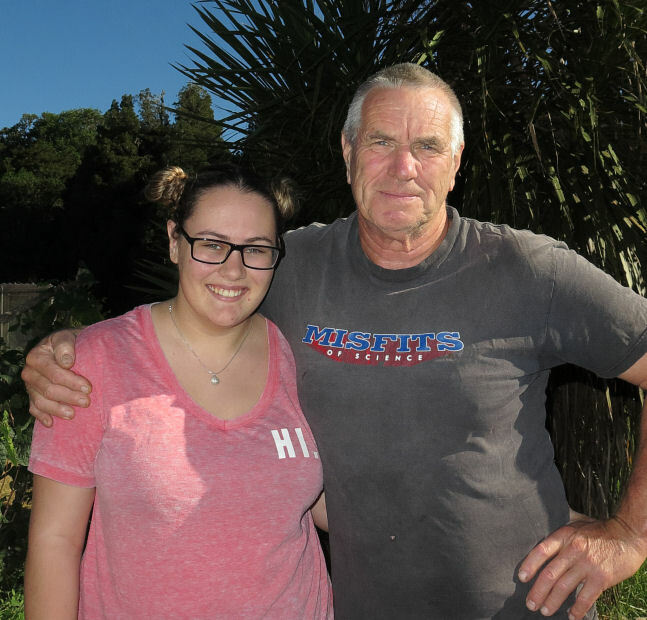 But then there was a message on the answerphone from my future surgeon, who was in Kaitaia to arrange his surgical list for four weeks from now, so I dashed into town to see him and missed the excitement at home. The kids had a great time in the pond, with Stephan recording some of it on my behalf. 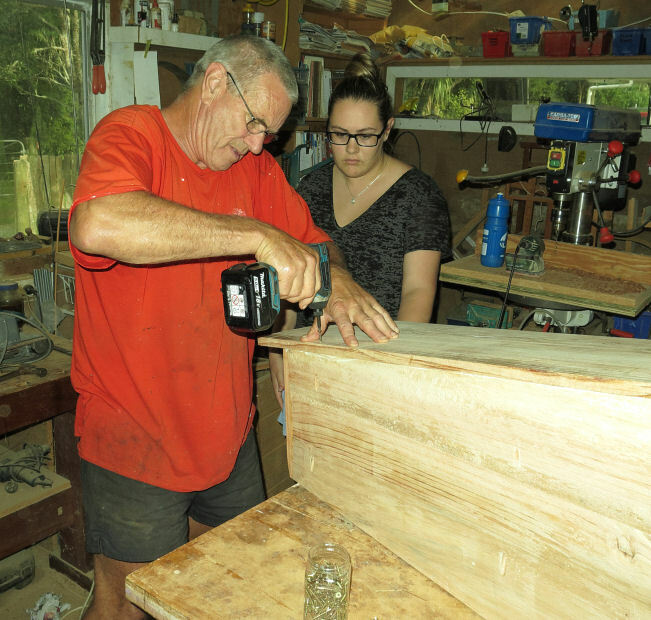 The coffin now has a lid and there's a request for a continuous handle along each side, rather than the soft ropes we'd originally all planned. I'm not sure how or whether the surface will be finished. I quite like the raw wood look, myself. Gertrude 162 continues to attract my attention. She's been tentatively on my to-keep list for a while, but I've not really decided yet. I'll make final decisions based on their next weights. Stephan and Ella were infected with a 'flu bug by some little boys a few days ago and Stephan is now so ill he's taken to his bed for most of yesterday and today. So far I am unaffected and hope to remain so! We'd planned to come out today to a Kikuyu management day at Aurere, near Taipa, but I came on my own instead. It was, as usual, quite well attended. It always amuses me to think back fifteen years or so ago, when all the farm advisors and most farmers were adamant that the only way to manage Kikuyu was to spray it out as often as necessary and completely re-grass with rye and clover. 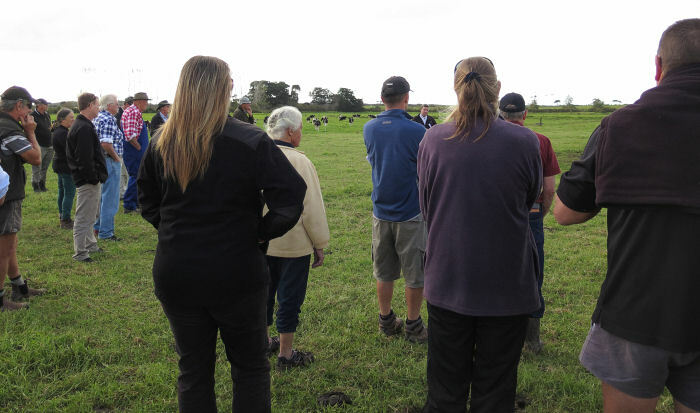 Now they're trialling the sort of management we've been practising throughout those years, looking at hard-grazing with cows, mowing and mulching. 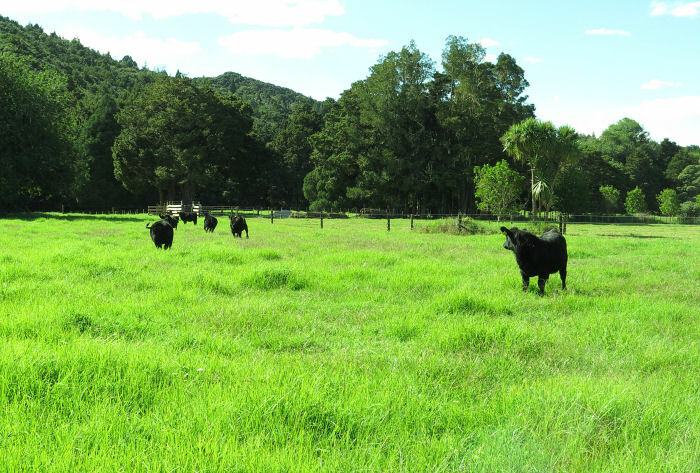 It turns out that grazing and then mowing is the most profitable management technique, along with oversowing or drilling winter-growing rye grasses. 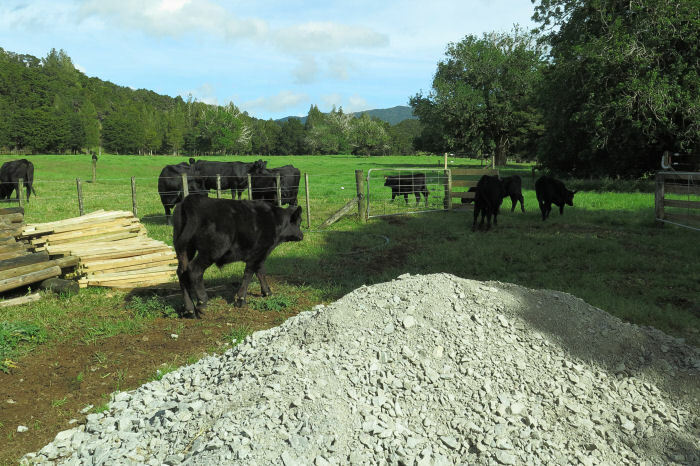 Lots of people really favour mulching but mulchers are big diesel-hungry machines which take large tractor power to run, along with taking longer to get around a paddock than one does when mowing. The trial work has been well worth seeing. Afterwards I went on to Mangonui to attend an advertised event at the community library, where an author and photographer were to speak about their book. The writer made an offensive 'casually racist' comment in response to a question from an audience member, which cast rather a pall for me on the evening. However I met up with a number of people I haven't seen for ages, discovered two lots of people I know now live in houses I used to visit often when I lived in Heretaunga Crescent near Cable Bay when I was a youngster, and my future surgeon popped over to say hello as well, since he lives sometimes in the area. 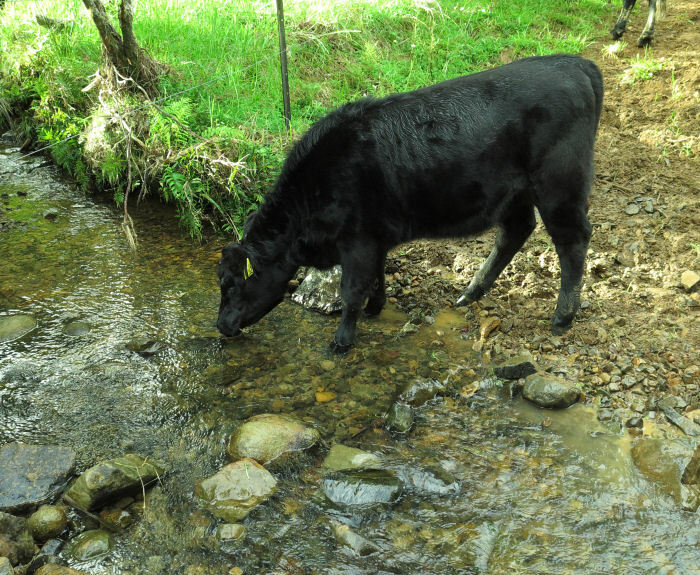 Somehow 725 wasn't in with the others when I checked early this morning but as she could graze the lanes and drink from the stream, it was easiest to leave her where she was in the mean time. I presume she got pushed out through the tape by one of the others, rather than that she chose to go. I had to get home so we could drive, again, to Whangarei. This time we went down for a knee specialist appointment, a very satisfactory visit, since the surgeon said he could quickly and easily fix Stephan's horrible pain, as soon as the ACC system approves funding for the operation. He hopefully said that could be in two to four weeks. His secretary said it was more likely to be four to six. Hopefully the approval will be quick and trouble-free!